NORTHRIDGE: The school district and the Licking County Sheriff’s office are taking another step in school safety. Last school year the school installed “buzz-in’ systems at all main entrances to ensure control of all entering the buildings. The Licking County SWAT team was also involved and contributed by teaching and training school faculty on an “active shooter” situation. The school is taking another large step to provide a safe learning environment for students. The school’s halls have not been roamed by the county's finest for five years. On October 21st students gained a little peace of mind knowing that school resource officers are back in the building. The Student Resource Officers are being funded by the district. The spend time and each of the school buildings during the day. Ms. Anderson stated that the school board has talked about this for awhile, and is not a response to any violence. Resource officers not only provide a source of security and protection but also provide students in need of someone to talk to about certain issues that school faculty cannot. The deputies can provide an outlet for students if necessary. The Officers can be another form of guidance for the teenagers of the middle and high schools. The officer’s prowess and sense of authority will also provide and support a positive atmosphere for the student body. The school has also gone even further to ensure the safety of its students and faculty by implementing and practicing safety drills and procedures. Carol took this picture with Shanlee Lamp ('15) on October 24. 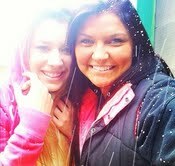 That day was the Carol's first time seeing snow! Mary went to her first formal dance ever when she went to Northridge's fall homecoming. This year Northridge has gained two new foreign exchange students. Carol came from Brazil and Mary came from Vietnam, and both of them are experiencing all news culture, events, lifestyle, food, and sports here in the United States. High school life in Vietnam and Brazil must be very different, and in many way similar to school here in the United States. Mary and Carol gave me insight on their experience's here and there. Carol likes the new events, students, teachers, subjects, and food here. She said her favorite food she has had here is Mac and Cheese, but she says most of the foods here are the same as in Brazil. She likes being at the football games, and hanging out with all of her friends. Carol is a boxer, and here is the US she can't hit people like she can back in Brazil, but that is her main sport. Carol came to a volleyball practice with the varsity team and decided she didn't like volleyball, and it was very hard. Carol said the biggest difference between the schooling here and the schooling in Brazil is that here she has different classes on different days so she learns a lot of subjects. Carol's subject is science. Mary says her experience in the United States has been very positive, and that she likes the small school environment she is in. Mary is on the soccer team which in Vietnam the girls at her school were not allowed to play on the school soccer team. Mary also plays ping-pong in Vietnam, but says here not many people play and it is not competitive in the US like it is back at home. Mary had positive things to say about all the students, and teachers in the school. She said Mrs. Miller is the best math teacher she has ever had, and that math is her favorite subject. Mary said she struggles with American History and English because it is new to her, and she is still getting use to it, but Mr. Bennett, and Ms. Murphy are very helpful. Mary has gone to many of the Northridge football games and enjoys watching the team, being apart of the student section, and hanging out with her friends. Outside of school events Mary has gone to church with her host family, and shopping with her friends which are two new things that she doesn't get to do in Vietnam. Mary said her favorite food she has had here in home made steak her host parents made. Mary said here many people like her tan skin, but in Vietnam people prefer paler skin. Mary went to homecoming, and said she really enjoyed dressing up because in Vietnam they don't have formal dances, or any school dances at all. Overall both Carol and Mary said their experiences so far in the United States, and at Northridge have been fun, and positive. I think they both will have plenty of new memories to tell their friends and families about back home. NORTHRIDGE – Winter is coming around, which means the start of swim season for the high school team. Sign-ups are available in the office for any high school student who wants to join the team. Practices start November 1 and will be every weeknight from 7:00 to 9:00 p.m. at the Trumbull Aquatics Center of Denison University. High school and middle school will practice together. Last year the team had a very successful season. 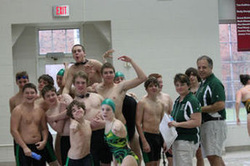 Four school records were broken, and six swimmers went to the District Championships. Josie Bunstine (’16) broke records in 200 Individual Medley, 500 Freestyle, 100 Butterfly, and 100 Breaststroke (measures in yards). Bunstine nearly made it to the State Championships in the Breast and Fly races. Prior to this season, the team practiced at the Mount Vernon YMCA, which was a 40-minute drive from the school. This year, the team was able to secure pool space at Denison University, in the new facility. “I think it’s great that we get to practice there,” says Love, who works as a lifeguard at Denison, along with Mat Scott (’15), another member of the swim team. Northridge and Granville high schools will share space in the Olympic-sized pool. Assistant coach Jeff Lindsay and new head coach Rachel Furr will be holding a meeting at the high school on Friday, November 1 at 2:15pm to get fitted for suits and discuss the season. There will be no practice at Denison until Monday, November 4. 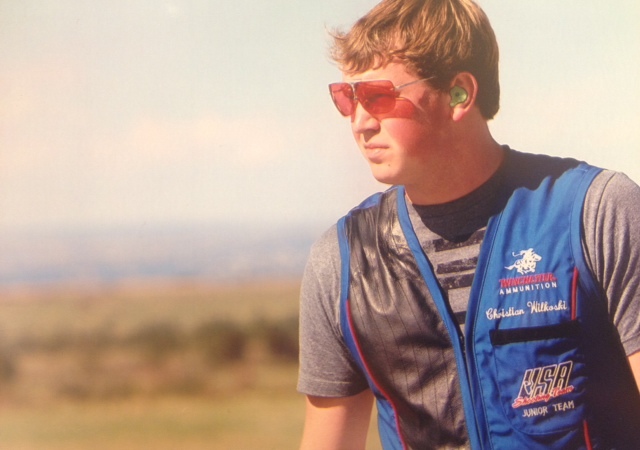 NORTHRIDGE- Chris Wilkoski and his trap shooting team got a golden sweep at Peru on September 15th to the 22nd. The junior team, junior open, and mens open events all received gold medals for the USA. 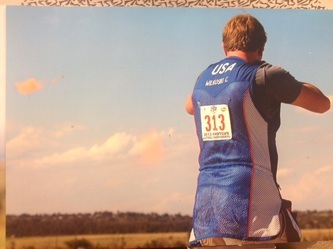 Wilkoski shoots a 12 gauge shot gun at clay targets going 50 miles per hour. He’s a member of the World Team and the Junior National Team. He shoots international doubles, which is two targets that are going faster and at harder angles. Wilkoski’s favorite part about his secret talent is traveling. He’s been to Dubai, Alian, Cyprus, and, most recently, Lima, Peru. Wilkoski just returned from Tucson, Arizona, finishing 5th overall and 2nd in juniors. He shot a 130 the first day and a 121 the second day (out of 150). “It was very windy and the conditions were terrible” Wilkoski said. This match and the spring collection match in Kerrville Texas will select who will shoot in the spring World Cup match. When Wilkoski was 7 years old he participated in a free trap shooting clinic in Centerburg. Here he found that he had a knack for the sport, and being tall helped too. His family has always been interested in guns and shooting. Wilkoski shoots with his friend, 2010 NHS grad, Billy Crawford. He says it makes traveling easier “having a friend there with you.” He plans to join Crawford at the Olympic Training Center in Colorado next summer. Haley Trimble is a sophomore currently enrolled in the Journalism class. She wrote this feature on Chris, and it was selected by newspaper editors for publication.